“The Joy of Love experienced by families is also the joy of the Church.” That is the beginning and the heart of Amoris Laetitia, Pope Francis’ apostolic exhortation on the joy of love. Amoris Laetitia reflects the results of recent synods on the family as well as other writings of Pope Francis and his predecessors. It speaks of the gifts and joys of families but, also, acknowledges the contemporary challenges which they face. The pope emphasizes the importance of marriage and family life, writing, “The welfare of the family is decisive for the future of the world and the Church.” The family, thus, is a source of strength for the Church, just as the Church is a source of strength for families. 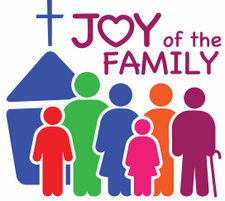 To celebrate, promote, protect and strengthen marriage and families in our world, the Diocese of Portland has launched the Joy of the Family initiative. A specific theme featured in Amoris Laetitia will be highlighted each month and will include opening and closing prayers, a reading, a passage from Amoris Laetitia, a "contemplate and share" section, intercessions, weekly suggestions for practical activities, and a reflection from an individual or individuals who possess a special personal connection to the monthly theme. You will find this month's reflection below. It is hoped developing these themes will help the faithful understand the teachings in Amoris Laetitia and inspire us all to integrate these teachings in our daily lives. to your glory and faithfulness. After the love that unites us to God, conjugal love is the “greatest form of friendship.” It is a union possessing all the traits of a good friendship: concern for the good of the other, reciprocity, intimacy, warmth, stability and the resemblance born of a shared life. Marriage joins to all this an indissoluble exclusivity expressed in the stable commitment to share and shape together the whole of life. Let us be honest and acknowledge the signs that this is the case. Lovers do not see their relationship as merely temporary. Those who marry do not expect their excitement to fade. Those who witness the celebration of a loving union, however fragile, trust that it will pass the test of time. Children not only want their parents to love one another, but also to be faithful and remain together. These and similar signs show that it is in the very nature of conjugal love to be definitive. The lasting union expressed by the marriage vows is more than a formality or a traditional formula; it is rooted in the natural inclinations of the human person. For believers, it is also a covenant before God that calls for fidelity (n. 123). • Amoris Laetitia confirms that quality time is a love language. How do we spend our time? When do we take time to give each family member some solid quality time, putting away distractions such as the cell phone and enjoying the person’s presence or engaging in meaningful, perhaps even silly, conversation? Thank God for the time spent together. • What commitments does our family have? What are some of the promises we have made to one another? How well do we keep them? When do we find it’s hard to live up to our commitments or promises? Discuss with as a family and resolve to grow stronger, staying faithful to God and one another. • What does our family need to live out the faith in the coming months and in years to come? How might we fulfill needs in our daily routines? Pray for these needed graces. • How do we show tenderness to one another as a family? How can we extend that tenderness and gift of self to neighbors or even people we do not know? Consider ways to do these things for one another. For example, write every family member’s name on a piece of paper. Place all the papers in a container. Have each person choose a slip of paper, making sure that the person does not have his or her own name. Throughout the week, show extra tenderness or give the gift of self to the person chosen. At the end of the week, talk with one another about how it felt treating one another this way, both as a giver and as a receiver. February 3: Commit to making your marriage covenant a priority in your life. Set aside time in your daily schedule to nourish your relationship with your spouse and with God. February 10: Give the gift of words this Valentine’s Day by sharing with your spouse why you love him/her. February 17: Pray for God’s graces upon those who are discerning vocations to the priesthood or consecrated life. Don’t be afraid to encourage someone whom you believe God may be calling to a religious vocation. February 24: Consider participating in a Worldwide Marriage Encounter or another marriage enrichment program. Check with your parish about opportunities in your area or visit https://portlanddiocese.org/marriage/enriching-marriage for some ideas. In Amoris Laetitia, our Holy Father writes, “Love needs time and space; everything else is secondary. Time is needed to talk things over, to embrace leisurely, to share plans, to listen to one another and gaze in each other’s eye, to appreciate one another and to build a stronger relationship. Sometimes, the frenetic pace of our society and the pressures of the workplace create problems. At other times, the problem is the lack of quality time together, sharing the same room without one even noticing the other.” n. 224. As a diocese, we committed time and space over the last year and half to reflecting on the Joy of the Family. Each month, Catholics from across Maine shared what they have learned about accepting and practicing the enduring fidelity God offers through relationship with him and each other. Our final Joy of the Family reflection highlights insights about faithfulness, which thrives through recognizing grace, renewing commitments, and living and handing on faith. As you read, recall how you have known joy in your own life and how you might spread this joy to others. Faithfulness is possible when we recognize gifts in each other and the grace God gives through our successes and failures. Mike and Diane Tyne recognize that the gift and grace of marriage “is a self-sacrificing vocation that calls us to die to ourselves and often put our wants aside for the sake of others,” (“The Joy of Marriage,” May 2017). Don & Ann Marie Clavette note the grace in their prayer as a couple: “Our shared prayer life has become the glue that has held us together throughout the joys and the challenges of married life and family life.” (“The Joy of Being a Holy Family,” December 2017). Suzanne Lafreniere reminds us that “If we don’t take the time to really focus on rest and relaxation in the company of family, life can seem like a hamster wheel we cannot jump off ... Consider how you can take time with your family, both daily and long-term. If it is anything like my experience, it will bring you both laughter and tears and is a concrete way to live out the grace of tenderness towards one another.” (“The Joy of Taking Time,” January 2018). The gift of family and sacramental graces of marriage, our own or those of the people around us, help us give ourselves in love again and again. Faithfulness involves simply saying “yes” to one another over and over in good times and bad. “Tenderness is very rarely complicated,” write Brian & Michele Bernier. “It is usually a simple action or way of acknowledging one another, born out of love and thoughtfulness toward the other” (“The Joy of Loving Tenderly,” February 2018). Brian Griffin shares, “Throughout our married life, I am continuing to look for small ways during the day to be a gift of self. Simple things like shoveling a path to the garage, so my wife doesn’t have to wade through deep snow to get to the car, or doing the dishes, even when she tells me she’ll take care of it, are simple sacrifices which make me a better person and improve our relationship by living out what we are called to do by God” (“The Joy of Passionate Love,” April 2018). Monsignor Andrew Dubois points out that connecting with parents and siblings can be a source for both joy and comfort throughout one’s life: “Like many families, we love coming together for no particular reason, as well as for special occasions. … But even during the more difficult times that life gives us all, we want to be in each other’s company and to seek each other’s support, solace, and strength” (The Joy of Family, April 2017). Witnessing enduring commitments like those between husbands and wives, brothers and sisters, and priests or religious and the Church show us that we too can be faithful. Faithfulness bears the fruits of the Holy Spirit as we live in the joy of God’s family and hand on faith in Jesus Christ. Father Michael Seavey reminds us that “For the Catholic Church, advocating for working people and their families is a core element of our mission” (“The Joy of Work,” September 2018). Michael Smith goes on to note, “Merciful service calls us to learn, understand, and journey with people to where they want to go, rather than coming in with our predetermined ideas of what is best for them and how to get there. Through this process, we empower those we are working with and better understand the nuances of their needs, which ultimately transforms us and our understanding of them” (“The Joy of Merciful Service,” October 2018). Deacon Luis & Julie Sanclemente remind us that families can be signs and sources of hope: “As parents, we hope to equip our children with the spiritual ‘weapons’ they’ll need to make prayer a priority and, ultimately, to increase the chance that we’ll get to see them in heaven” (“The Joy of Prayer in the Family,” November 2018). “Christian families in any part of the world can be joyful, despite many challenges, if they follow the footsteps of the family of Nazareth,” Father Arokiasamy Santhiyagu, HGN, adds. “The family of Nazareth is raised to the realm of the Holy Family and stands as the role model for all families in the world because St. Joseph, the Blessed Virgin Mary, and our Lord Jesus only did the will of God throughout their lives” (“The Joy of the Family of Families,” January 2019). As we conclude this meditation on Amoris Laetitia, let us celebrate that, in the words of Bishop Robert Deeley, “family, particularly the extended one, is a good place to learn that life is richer when we learn to live with each other and care for each other” (“The Joy of Extended Family,” December 2018). Please return to the Joy of Family reflections whenever you need a reminder that authentic faith and enduring fidelity are not ends in themselves, that these gifts must be shared so God’s graces inherent in them can bless us and multiply for the good of the world.